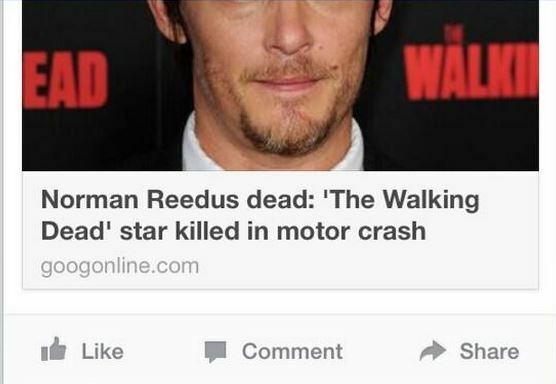 Be aware of the ‘Norman Reedus dead ‘the walking dead’ star killed in motor crash’ hoax. Cybercriminals have armed the Norman Reedus dead ‘the walking dead’ star killed in motor crash hoax with a malicious survey which will try to install a malicious application on the unaware visitors device. The hackers are spreading various schemes and hoaxes as these schemes will provide them a solid online revenue. Other hackers choose to infect their unaware visitors with malicious applications. These applications allow the hackers to infect the unaware users. Once the hackers have infected the unaware users, they will be able to control their device.